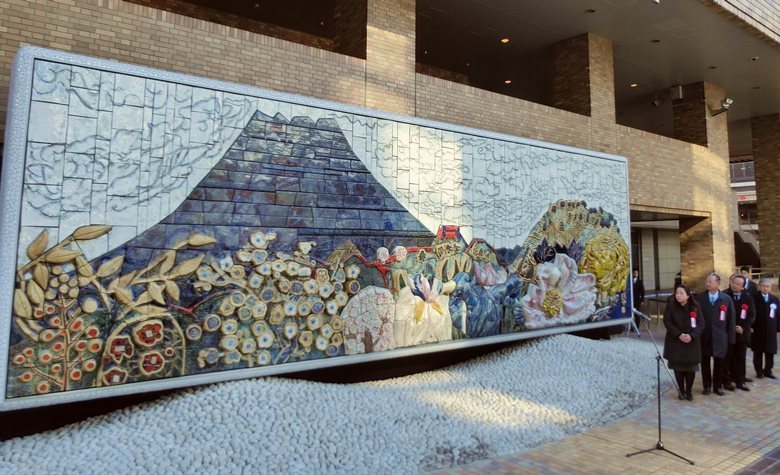 An unveiling ceremony of an art work of ceramic relief was held on January 15th. at Sunshine City, a composite commercial compound situated at Ikebukuro, one of the main terminal of Tokyo. The original design of this ceramic relief, the title is <The four seasons of Edo>, was drawn by prominent Japanese style painter Ms. KATAOKA Tamako (1905-2008). It was created in 1978 to celebrate the opening of Sunshine City. At that time, the ceramic relief had been placed at the underground main entrance. But this time due to the renewal of building, it was removed to the ground, and put it in the west front of the building. A magnificent 3.3m high, 14m long ceramic relief appeared after a veil was taken away, and applause happened all at once. There was the person who stopped, and watched it. During Edo period (17-19 century), people was able to look at Fuji mountain from the various places of Edo (Actual Tokyo) and in <The four seasons of Edo> , sacred Fuji is described in a powerful touch. The ceramic relief in the natural light is different from looking under the underground illumination, so come to look by all means. One of the guests Ms. KATAOKA Sawako, a daughter of painter, said “ This art work was created when my mother was 73 years old. I think she is very glad today that it is still brighter when I watch in outside light”.